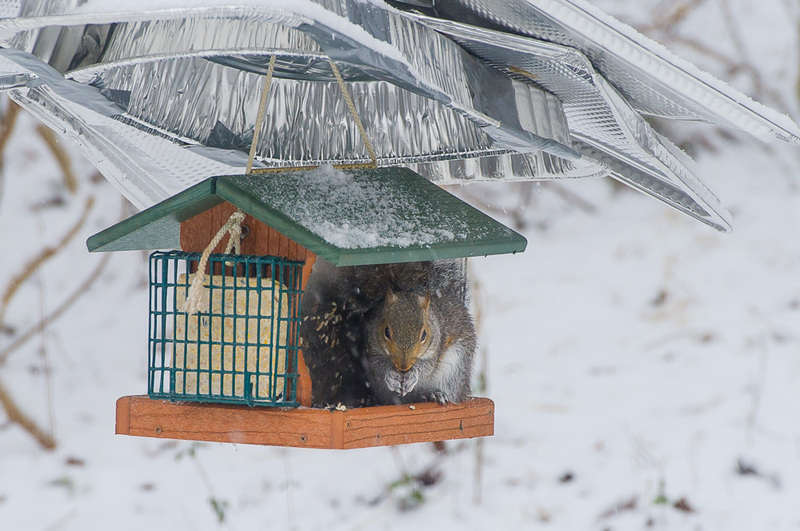 This winter, we’ve tried a variety of squirrel proofing for our bird feeders. But, so far, we’ve failed miserably. Each day, a half-dozen squirrels feast on our bird feed and fight and chase one another up and down trees and all over the yard, scaring off the birds. My favorite feeder isn’t squirrel proof, so my husband took it on as his personal quest to create a barrier to prevent the squirrels from accessing the seed. After purchasing a variety of aluminum and metal pans and sheets, drilling holes and adding various pieces of hardware, he hung each one hoping for the best. Usually, it took some time for the squirrels to figure out a way around the barrier, but eventually they did. We would start out laughing at their antics, as they hung upside-down, as they slid off the slick metal and dropped into the snow, while they tried in vain to leap from the tree trunk to the feeder. But then our amusement would turn to dismay as we watched them figure out a way to balance on the metal sheets, hang precariously from a nearby branch and swing onto the feeder or grab the slick sides and shimmy down. 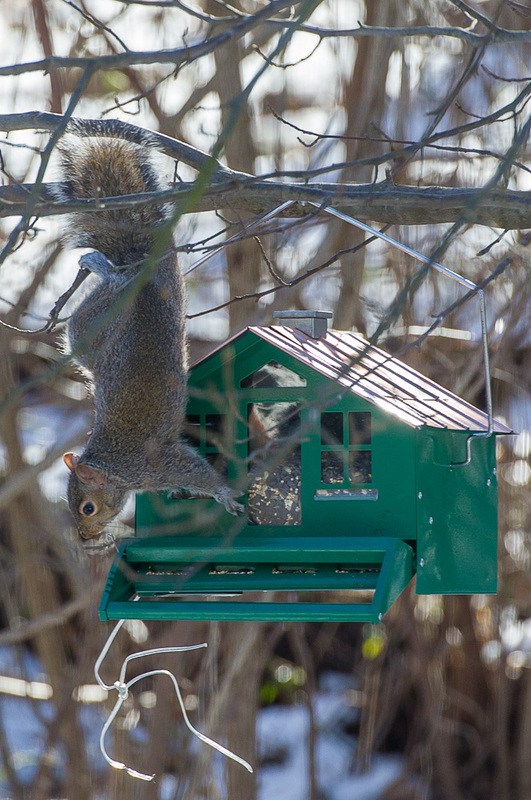 Finally, for Christmas I purchased my husband a squirrel-proof feeder, spending a small fortune for one that was guaranteed to keep the squirrels at bay. It worked for maybe a week, until in their angst the squirrels succeeded in knocking the feeder off the tree. Now, slightly damaged, it doesn’t work quite as well, and they’ve figured out just how much weight it will hold before the door closes their access to the seed. At first, I enjoyed watching the squirrels, but now they’re overwhelming. They dominate the feeders and have even damaged them while the birds sit in the trees waiting for a rare opening. Peppermint has even given up the chase, knowing that she’ll never catch one and no doubt growing annoyed with their chattering and scolding when she strolls around the yard. She’ll only occasionally show some enthusiasm when I open the door if a bold one tries to stare her down from ground level. Unfortunately, I think we’ve lost this first battle. It’s time to retreat and figure out a Plan B. It’s just a matter of further innovation, adapting our initial ideas and out thinking these small, gray rodents….they’ve pushed us to move beyond the roasting pans, and we’ll take up the challenge! We are at war off an on with our squirrels too. Right now we are in submission and simply filling the seed & suet feeders more than we want and the squirrels are nice and plump. I wouldn’t mind feeding a couple of squirrels, but we’re up to six constant visitors now, and that’s a lot of seed! I think I’ll try a separate feeder for them and just maybe they’ll relocate. Ohhh…..the sweet squirrels need love too. Put a few nails around on posts and trees and put an ear of dried corn on them then they will choose the easy way out to their own feeding stations! Here is what has worked for me, at least for now. There is a critical height above which squirrels can’t jump. So I put a five foot length of slick stove pipe around the stem of the feeder pole, and then polished it with several coats of furniture polish. The bottom of the feeder is right at the top of the stove pipe, and so far, squirrels have not been able to reach it. Thanks, Sue! A great idea about the furniture polish…never heard of that before. I hung a new feeder today but was worried about them climbing up an adjacent post and leaping over to it. I will try the furniture polish on the post tomorrow.